Size: What size weighted blanket should you buy? Weighted blankets are meant to fit the body, not the bed. The larger you are, the larger the blanket should be. Weight: How heavy should a weighted blanket be? Well, the general rule of thumb is to choose a weight that is ten percent of the user’s body weight with an additional pound or two included. Consider growth as well if it’s for a child. Color Options: Do you want it to match your decor? Do you want it to be your favorite color. Again, when choosing a weighted blanket, the color is based upon personal preference. There are usually many different colors to pick from. Material: There are tons of weighted blanket materials out there that could be used for your blanket. This is another personal preference thing. However, you can choose from cotton for cool, flannel for warmth, satin-cotton for heat sensitivities, and more. 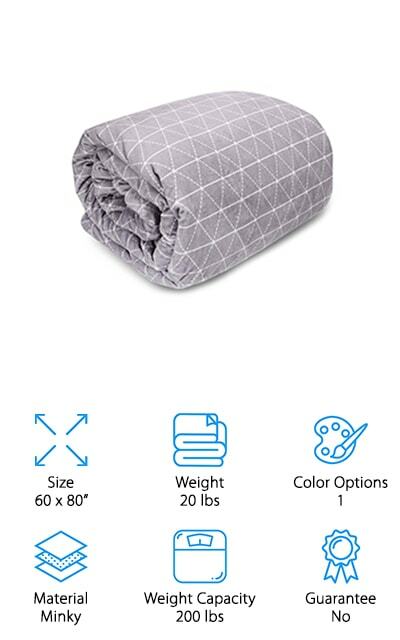 Weight Capacity: Your weight goes hand in hand with the size of your weighted blanket. The larger you are, the more weight you are going to need. So, a 20 lb weighted blanket would have a capacity of 150-200 pounds and so on. Guarantee: Blankets are prone to ripping, loose stitching, and even the loss of the weights. This is why is it important to make sure that the weighted blanket of your choosing has a good enough guarantee in the event that something happens to it. So now you know what to look for when asking “What is the best weighted blanket”. These are just a piece of the puzzle that you would need to find the absolute best blanket you can. Our weighted blanket buying guide will help you find what you’re looking for if you still aren’t sure. If you’re in a rush, check out our top pick. Do your pockets only have a little cash in them? Check out the budget pick. At the top of our list is the Harkla Weighted Blanket. 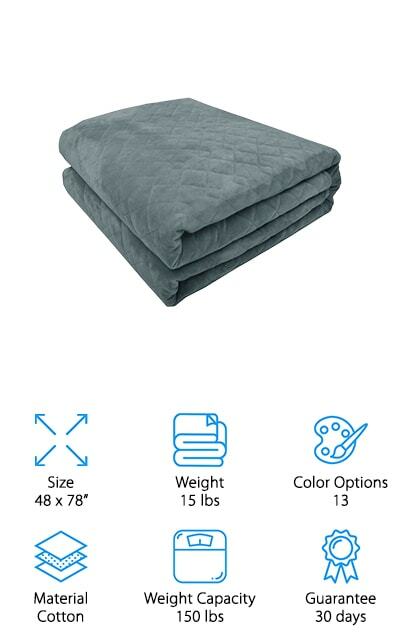 This has been selected as the top rated weighted blanket. The Harkla is made from a very soft Minky fabric that is soft to touch and kids will love it. There are extra slots that have sensory input when you run your hands over it. There are several options that you can choose from when it comes to size, color, and weight. This duvet-style weighted blanket is ideal for giving people calming pressure. It is easy to wash and dry with the 2-piece cover and padding removal. 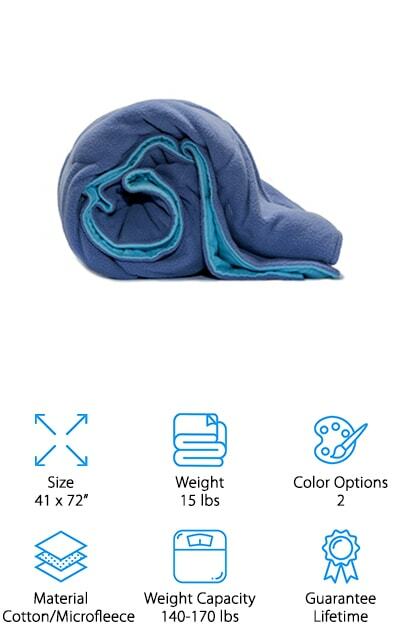 Not only can the weight of this blanket be super helpful for a variety of reasons, but it has a lifetime money back guarantee. If you aren’t 100% satisfied, you are entitled to all of your money back. These reasons are why it’s considered to be the best heavy blanket. Even though the YnM Weighted Blanket is on here as our budget pick as the most inexpensive weighted blanket, it’s still a great product. The inner layer of this blanket is made of 100% premium breathable cotton. Each one of the small compartments inside of this blanket is filled with hypoallergenic, odorless, non-toxic glass beads that aren’t bumpy like the plastic pellets in the other blankets. The inner layer of the blanket is machine-washable on a gentle and low setting. You have many options available to you when it comes to sizes, colors, and weight. Right now, there are 22 color options that you can choose from between all of the different sizes. With all of the features that this blanket, it’s hard to believe the affordable price. Due to the weight of it, it is not necessary to choose a huge size. It should be 10% of your body weight plus 1 lb more than what you weigh. 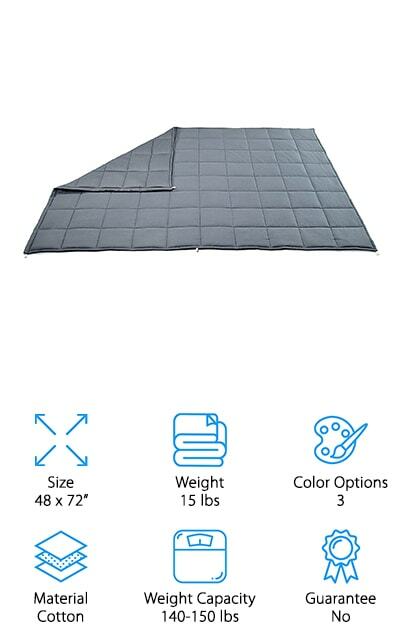 This Queen sized weighted blanket has a lot of cool features that come along with it.. You will find industry exclusive evenflow technology in the blanket that gives you maximum comfort and relaxation. This blanket can make you feel like you are being hugged thanks to the “calmforters” cloudsoft polyfill and stardust microbead weighing system. The Minky cover is ultra soft and you won’t notice lumpy square pockets. There is a two-part construction for simple washing and a long lasting life. The cover simply zips apart and can be repeatedly washed. 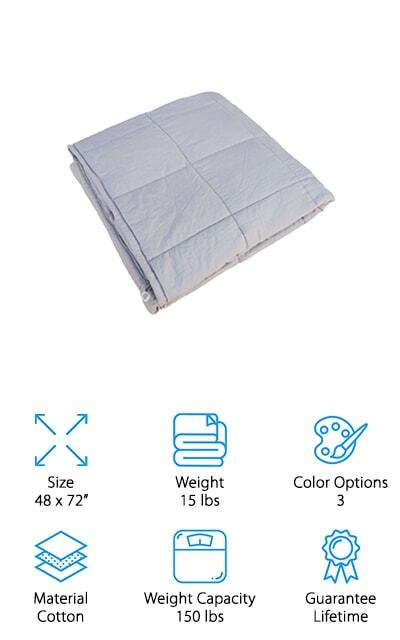 This blanket has a generous 60x80 dimension with a 12 lb weight and 120 lb weight capacity. You can double the blanket up for maximum pressure. Most studies show that the best blanket has a 12 lb weight for most users. If you want a lighter blanket, you have that option available to you. The ZonLi is a great weighted blanket for adults because of its 60 x 80-inch dimension and 15 lb weight. It is made from premium 100% cotton that is sewn into small squares and filled with small pellets that help distribute weight evenly across your body to give you better comfort. There are multiple uses for your blanket including placing it on the lap, shoulders, neck, back, legs, and whole body. The inner weighted blankets are machine-washable on a gentle setting. However, it is better to dry clean or hand wash them. You can purchase the duvet cover for it if you would rather keep it clean that way. There are multiple sizes and weight options available, all the way up to 25 pounds. This is best for larger individuals up to 300 pounds. The twin size weighted blanket would be best for a kid and the larger sizes for the adults. One of the best rated weighted blankets on the market right now is the Weighted Idea Weighted Blanket. This is a healthy and natural remedy for relaxation. It offers you the feeling of being hugged and it’s the ideal size for more bed types. You want the blanket to cover the entire body, but you can use it on your legs as well. 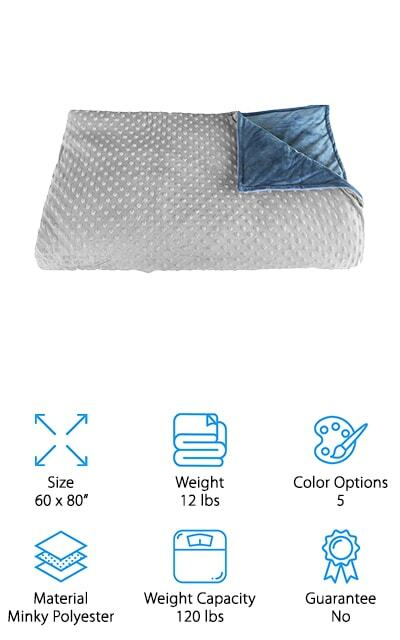 This weighted blanket is made of only the highest quality materials. This one is made from 100% premium cotton fabric that is breathable and natural to the body. There is a removable duvet cover that is made from Minky material. All of the sand-sized pellets are evenly distributed throughout the blanket for comfortable compression. At the moment, there are thirteen color options that you can choose from and 12 size and weight combinations. That’s a pretty good selection, especially for the price. If for any reason you aren’t happy, you can refund or exchange your product within 30-days. The Kpblis Weighted Blanket is one of the most affordable items in this weighted blanket review guide. The inner layer of this blanket is made from 100% cotton fabric, which is breathable and natural. Each blanket is filled with non-toxic and hypoallergenic plastic poly pellets for weight. There is a unique square design sewn into small pieces throughout the blanket. These make the blanket evenly distribute weight so that the blanket is more durable and comfortable. The inner layer is machine washable on a low setting. You can also purchase the duvet to go along with the blanket. This blanket is a good choice for you if you are looking to feel the comforting pressure of a hug. It weighs 15 lbs and has a weight capacity of 150-200 lbs. 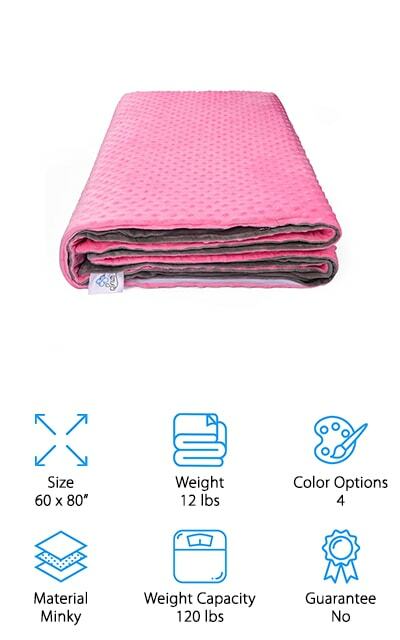 The Amy Garden blanket is a great weighted blanket for sleep. It is ideal for helping you fall asleep and stay asleep longer thanks to the comforting weight of the blanket. The size of this one is 48 x 72 inches and it weighs 15 lbs. It comes with three color options, but there are more options for the separate duvet cover. It’s made from 100% cotton and all of the compartments are made with hypoallergenic and non-toxic plastic poly pellets. The weight is evenly distributed throughout the blanket for optimal comfort and durability. The inner blanket does require a dry cleaner to get it cleaned. This can be an expensive task, so the duvet cover is highly recommended. 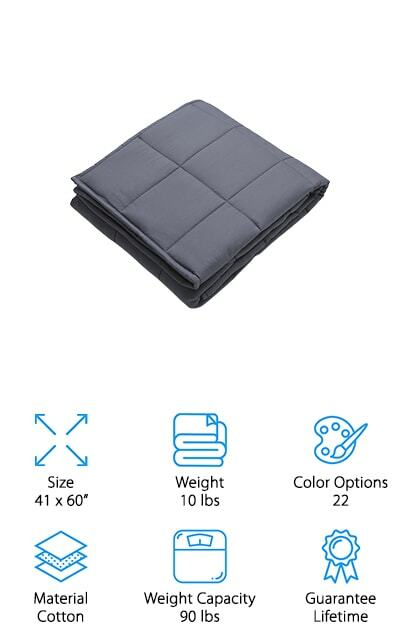 This weighted blanket should never go past the shoulders and should never cover your head. It has a weight capacity of 140-150 pounds. This is among some of the best weighted blanket reviews for a variety of reasons. This blanket can be used at bedtime to create a calm and relaxing sleeping environment. You can also put it on your lap while you are reading or during a long ride or flight. This particular blanket can be draped over the shoulders for a calming hug-like feel. This particular blanket is made from cotton and microfleece. It has a weight capacity of 140-170 lbs and a weight of 15 lbs. The company is one of the many that offers a lifetime guarantee on their product. If for any reason you aren’t satisfied with their product, you can return it for a full refund, no questions asked. Another great feature of this blanket is that is can be machine washed and air dried. Nothing like that fresh air smell on your blankets after a full day of swaying in the breeze. 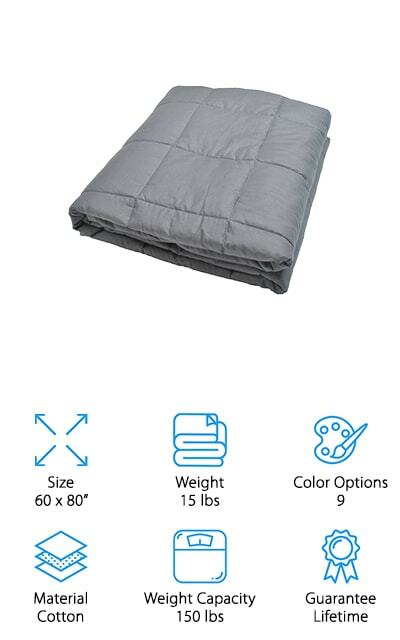 If you’re looking for something close to a king size weighted blanket, this is a good option. This 60 x 80 inch blanket by Rocabi is made from premium Minky Material. It also has a mixture of polyester and microfiber mixed in there as well. This adult weighted blanket can help you get a longer and deeper sleep with the hugging comfort that it comes with. It is engineered to be 7%-12% of your body weight. They take their maintenance very seriously, so the cover of this blanket is machine washable, interchangeable, hygienic, and removable to help prolong the lifespan of your blanket. Weighted blankets are meant to create a sense of being swaddled. This helps to form a physical connection for a sense of warmth, comfort, and more. The Snuzi does this by grounding you. No, not like your parents did when you got caught doing something bad. It’s actually called earthing and it’s a type of calming effect. 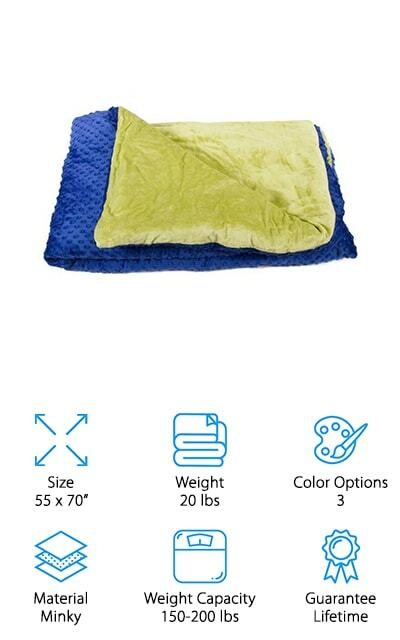 This 60 x 80 and 12 lb blanket is perfect for individuals up to 120 lbs. It is made with premium Minky material with a 100% cotton inner layer. It is weighed down with hypoallergenic and odorless pellets that are much more healthy than standard plastic pellets. This blanket is super easy to wash because the outer layer unzips. However, it should be air dried. There is no need to wash the inner blanket too much to maintain its durability and longevity. It’s definitely a versatile blanket for everybody and if you need to, you can fold it in half for double the weight.